In October 2015 I flew south for 1 week in hunt of some sun, history and new experiences. 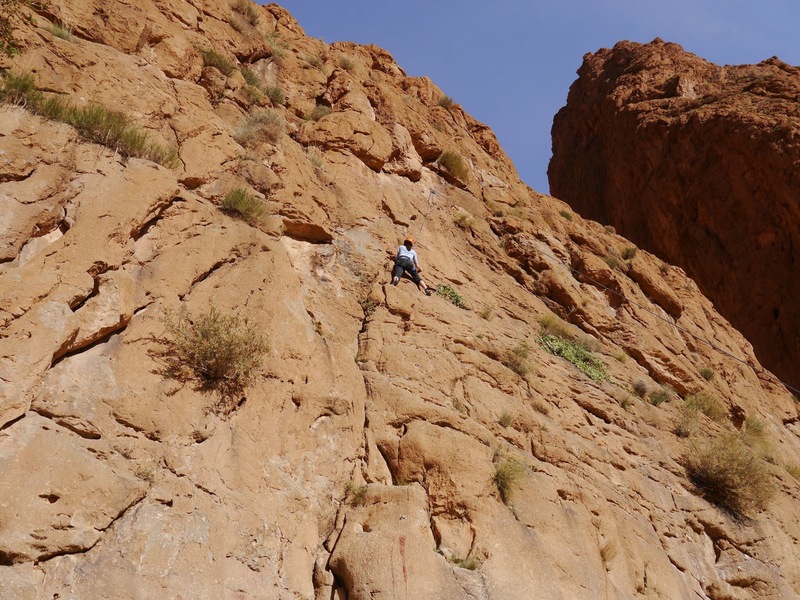 I joined a Busabout tour in Morocco and spent a jam-packed week touring from Marrakech over to the Sahara and back again. Busabout’s Morocco route, showing the number of nights spent in each location. After some initial hiccups and language barriers in finding the ride that had been arranged for me from the airport, I made it to my hotel. You always need to be prepared for not such a smooth journey when you arrive in your destination – have a phone number for the tour company on hand! I had missed the briefing but my guide Mustapha had left me a note and map with all the information I needed for the tour. At 9am the next day, we were off – 8 of us from UK, USA, Australia and New Zealand, all in our 20s or 30s, in a spacious minibus with Mustapha and our driver Mohamed. 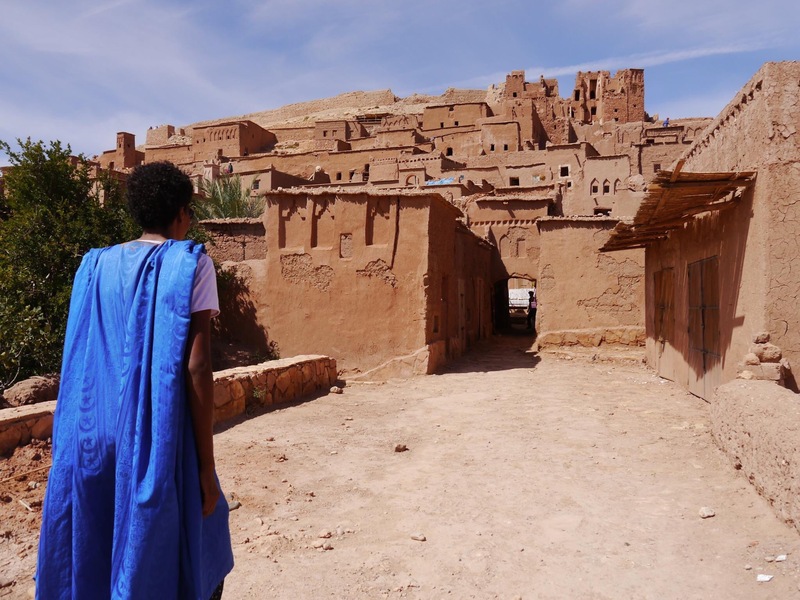 We passed several groups of Berber nomads on our journey, travelling with sheep or goats or camels, and were given a great history lesson by Mustapha – one of the many benefits of joining a tour group with a local guide! When the French ruled Morocco they had many clashes with the nomads, before a treaty was finally signed. There are still conflicts in the desert around the Algerian border, and we passed several hills where the phrase “the desert is ours” had been written in Arabic out of stones. The next day we reached the Sahara. The roads got rougher and long before the sand appeared, the ground had transformed into rolling hills of reflective black stone, with patches of salt shining in the sunlight. Any sign of civilisation was marked by clumps of green oasis in the distance. When we were close enough to see sand there were walls of palm tree branches lining the roads to keep them clear. We went inside some ancient wells that looked like giant ant hills, long since dried up. And finally, the sight we had all been waiting for – the distinctive orange dunes appeared on the horizon. 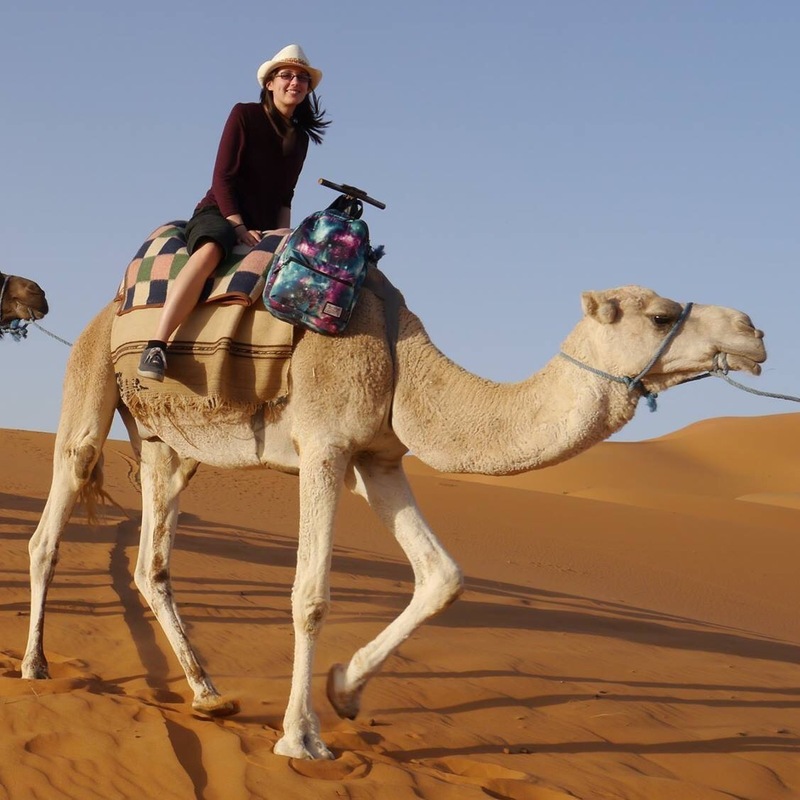 We rode camels into the dunes – which is a far less comfortable experience than you might expect. Even in the sand small clumps of dry grass still grow. The shadows of the camels stretched far out across the slopes as the sun lowered in the sky. We made it to the traditional Berber camp and Mustapha supplied a sandboard for us to try on the dunes, then from nowhere a kitten came up the hill to join us! When the sun set we had dinner and listened to some traditional drumming around a bonfire, then it was time to sleep under the Milky Way and watch out for shooting stars. I’ve never seen the sky as clear and filled with twinkling crystals as it was on that night. I lost count of the shooting stars I saw. In the morning we were woken up early to watch the sunrise from the camels, then we started out loop back out of the desert. After a long day of driving we reached Ouarzazate (prounced war-za-zat), which is a popular movie set location. It was too late to do anything other then go on a short trip to the high street to look around some shops, but we got a gorgeous sunset that evening while eating the usual yummy dinner of tagine. Finally, back to Marrakech. We had a tour around the inner city (definitely needed, the place is a maze!) then explored the medina to do some souvenir shopping (bartering required), visited a few historic buildings like the old religious school Ben Youssef Madrasa, and spent an hour or so in a hammam (Moroccan spa). In the evening we had our final dinner as a Busabout tour group with Mustapha in the central Djemaa el Fna square, which comes alive at night with countless pop up restaurants to choose between. The next morning was my last day in Morocco. I went back to the inner city with one of the other people who’d been on my tour and we set out in search of the royal palace (which was closed), Kasbah mosque (which we couldn’t go inside) and the Marrakech Museum (by which point we had run out of time). Despite all of this and getting lost in the medina again, I had a great morning of wandering around, finding new streets and an excellent lunch of one final tagine at a restaurant we came across by chance. For the rest of the day I read a book by the pool in the hotel, before travelling back to the airport to fly home. A whirlwind of a week – so much was packed in it felt like I’d been there for two. Although as a tourist on an organised tour you’re never going to get a full picture, and the trip was very touristy, being in a small group and having a local guide helped enormously. Despite the problems at the airport on arrival, my Busabout tour in Morocco was excellent and I’m very happy I picked it. I got a snapshot of a place so very different to what I’m used to, and I have every intention of returning to Morocco. In the north in particular there are so many places I didn’t get to see – Casablanca, Fes, Tangier, and especially the blue town of Chefchaouen. Another week sometime soon! A page from my travel scrapbook. Busabout supplied a map with the Morocco route drawn out, and Mustapha wrote my name in Arabic during our last group dinner. What a fabulous sounding trip! The more group trips I go on as a solo traveller, the more I tend to totally be in favour of them as a travel style. I love how much you can learn from your local guide, and it sounds like yours was great. I benefit hugely from their knowledge and know I walk away much more informed than if I was just trying to read the odd guide book or information board. Morocco needs to go on my list! 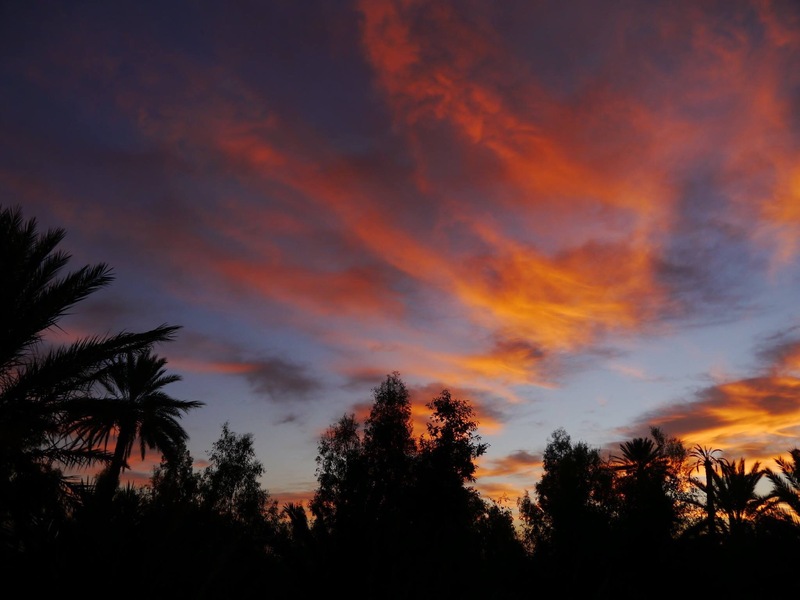 Both the Marrakech city tour and the tour around Ait-Benhaddou were included in the Busabout package, but with specialised tour guides who knew those locations even better. Enjoy your trip! Are you going on a tour or doing things solo? Thanks! The rock climbing was fun, but much more difficult than I expected near the end when my arms were tired!